BoneJ is transitioning to BoneJ2, and BoneJ 1.x is now legacy software. BoneJ2 is available to download and install from its own ImageJ update site. Our images are big (several gigabytes). Other software crashed when we tried to load more than 600MB. Other software failed to open even our small images. ImageJ opens a huge range of image formats. Some things we wanted to do were not implemented in other software. Or when they were implemented, code could not be examined. We didn't want a black box sitting in the middle of our experiments. BoneJ is open source (the source is in the .jar), so you can see where your results come from. Some useful things had become available for ImageJ, like the Local Thickness plugin. Licences are expensive, especially when compared to the cost of a postdoc's time. Java is 32- and 64-bit, multithreaded and runs on lots of OS's (Linux, Mac OS X, Windows, Solaris). Where there is Java, ImageJ and BoneJ can run. The original project was funded by the BBSRC, which means British taxpayers paid for much of (but not all of) BoneJ. So, in the spirit of public openness, BoneJ is available to all our funders. Remember to list the version numbers of BoneJ (Help > About Plugins... > BoneJ) and ImageJ (Help > About ImageJ) because these represent defined states of the programs, which can be looked up and examined thanks to Git tagging. The green OA author manuscript is available here. To install BoneJ, make sure you have a recent version of ImageJ and drag this link to BoneJ_.jar onto ImageJ, or save it in your ImageJ/plugins directory and refresh ImageJ's plugins with Help->Refresh Menus. There is one important dependency - Benjamin Schmid's 3D Viewer. Installation is the same as for BoneJ; drag the link to the .jar file onto ImageJ or save the .jar in your ImageJ/plugins directory. Make sure to run ImageJ 3D Viewer, which will prompt you to install Java's 3D libraries if you don't already have them. BoneJ has been downloaded 46935 times by 25098 unique hosts since March 2010, and is now version 1.4.3 (8 August 2018). Classify, count and measure skeleton branches and junctions. Based on Ignacio Arganda Carreras' AnalyzeSkeleton_. Use the mean intercept length (MIL) method to determine degree of anisotropy. Calculates the Euler characteristic of an image, and works out the connectivity density (Conn.D), which can be interpreted as trabecular number per mm3. Fits ellipsoids within the structure's geometry and computes a local Ellipsoid Factor classification basd on ellipsoid aspect ratios. Uses the box counting method to calculate fractal dimension. Creates and optionally displays a 3D surface mesh and measures the surface area, to calculate bone surface (BS). Prepares an image for connectivity analysis. Find the skeleton of a structure using a topology-maintaining medial axis thinning algorithm implemented by Ignacio Arganda Carreras. Calculates the structure model index (SMI), a measure of how rod- or plate-like trabeculae are. The user can choose between mesh-based (Hildebrand & Rüegsegger method, preferred) and voxel-based (SkyScan) structure dilation. Uses a histogram from whole stack (rather than the current slice) to autothreshold, and optionally attempts to choose a threshold that minimises connectivity. Calculates the thickness of foreground and background to give trabecular thickness (Tb.Th) and separation (Tb.Sp). Based on Bob Dougherty's Local Thickness plugin. Determines the proportion of the image volume that is foreground (BV/TV). Finds the best-fitting ellipsoid from a set of point ROI's in the ROI Manager. Finds the best-fitting sphere from a set of point ROI's in the ROI Manager. Calculates the moments of inertia of a structure, such as a whole bone. Works out the neck-shaft angle and curvature of the femur. Calculates cross-sectional parameters such as second moment of area and section modulus. 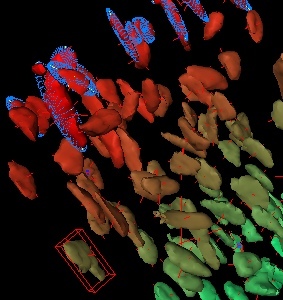 Finds and measures particles in a 3D binary image stack. Draws interactive 3D graphical output. Installs under Plugins->Analyze->Particle Analyser. 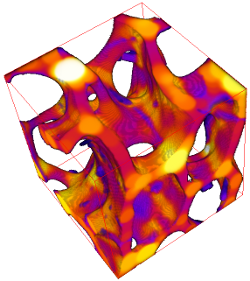 Particle Analyser is an experimental branch of the 3D Object Counter, which is being maintained at Fiji and on the Wiki. BoneJ plugins are designed to be called from ImageJ macros, to make them easy to run on a whole directory of images. This is an example batch macro that measures BV/TV, Tb.N, Tb.Sp and Tb.Th on a directory of cropped, binary image stacks. The easiest way to modify this script is to record your desired sequence of menu commands with ImageJ's macro recorder (Plugins-Macros-Record), and copy-paste the new commands into the macro. Archived user and developer messages are posted at the old Google group, which is closed to new users and messages. BoneJ is in active development. If you'd like to help develop BoneJ or you just want to see the code, have a look at BoneJ at github. The Java source code is included in BoneJ_.jar, if you would like to see where your results come from. If you want to know the version of BoneJ you have, run Help > About Plugins > BoneJ. Then, send a message to the ImageJ forum using the BoneJ tag describing what you're trying to do and what actually happened. Attach any error or exception messages to your forum posting. BoneJ is intended to be transparent and free. All the new code is Copyright Michael Doube and licensed under GNU General Public License version 3. Code incorporated in BoneJ has come from several sources. Use of BoneJ implies that you accept the terms of the licenses of all the individual plugins. Terms are generally not onerous, but it's worth checking them out so you know where you stand. This file last modified 0717hrs 02 October 2018 © Michael Doube 2004-2019 :: Designed to be interoperable and standards-compliant.